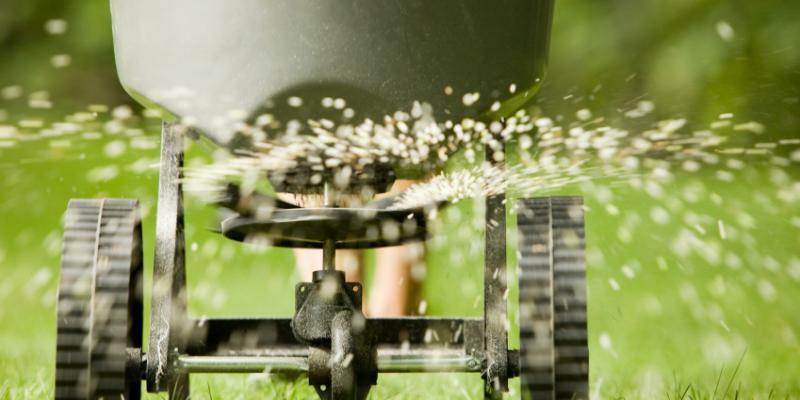 In January 2011, a bill was signed that restricted the use and timing of fertilizers applied by professionals and homeowners. Signed by New Jersey Governor Chris Christie, the bill (A. 2290), was enacted to help protect our water quality. Through negotiations and scientiﬁc recommendations this will ensure that professionals perform their duties in an environmentally responsible manner. Full information and details can be reviewed at www.njgic.org. Any application of fertilizer containing nitrogen or phosphorous will need to be done between March 1st and November 30th. Lime, potassium products or compost are still legal to apply outside the dates listed above. Quantities of nitrogen (which is the part of the fertilizer that makes a lawn green) will be restricted. Twenty percent of the nitrogen will have to be slow release nitrogen, which may lead to an increase in costs. Phosphorous will totally be restricted unless a soil test proves that it is needed to establish turf after a disturbance. All Professionals must be CERTIFIED to apply any type of fertilizer, effective as of January 5, 2012. You should be sure to ask your current provider if they are certified. By Law, pre-notification and posting is required before any lawn, and/ or tree and shrub application is performed. The notiﬁcation can be in writing, via email or by telephone. Pre—posting must be done at least 72 hours prior to each application on large sites. Weather can push dates back and should be noted as a reminder with the posting. A label and MSDS should be available upon request for any resident or management company on site. After the application is complete it is also necessary to provide a state regulated pesticide sign at entry points in around the properties. Meeting these requirements eliminates confusion and reﬂects credibility and professionalism from your turf and tree and shrub care companies. In recent years, synthetic fertilizer and pesticide products were used frequently and abundantly. With a greater emphasis now on environmental awareness, our partners in the Green Industry have developed new options, made vast improvements with regard to synthetic materials and introduced many more organic options. There are pros and cons to both types of products. However, the reality is we need both of these products to effectively treat pests, weeds and maintain healthy plants while being environmentally sensitive. Organic-based products are beneﬁcial in many ways. Organic fertilizer has a great slow release quality that enables it to be combined with synthetic fertilizer to get maximum performance and aesthetics for the plants. This enables our organic product to become the base or carrier for even Pesticide products. Weed control products and insecticide products for our outdoor plants have become environmentally friendlier as well. Most products have a much smaller percentage of active ingredients and are, in essence, organic-based. In the past, most products were oil-based, but now almost all of them are water-based. Using a water-based product instead of an oil-based one reduced the residual left behind to almost zero. Water-based materials will work on weeds or insects as needed but will naturally dissipate and lose toxicity hundreds of times faster than oil-based products. Rain, evaporation caused by the sun, heat from weather or mechanical irrigation all are ways the products are dissipated. This will make re-entry into an area safer faster. All of the products used have labels and MSDS which are available from your Professional Turf Care Company. Lawn Connection is a leader in providing organic based programs with limited pesticide use. Contact Lawn Connection for information and consultation for your property. All lawns have insects and fungus present. All trees and shrubs have insects and fungus present as well. Weed seeds are always lurking and waiting to take over ﬂower beds and lawns. So, what do I do? Do I treat my property with pesticides to combat these problems? Yes and No. Environmental and external factors play a major role in how many insects populate a given area and what sort of damage is done to plants. If a plant is weakened by environmental or external factors, it will struggle to ﬁght off a disease or fungus. Irrigating properly, pruning properly, cutting the grass correctly and timely applications will prevent and eliminate many of those problems. Not 100 percent, but at least 80 to 9O percent of them. When we prevent or eliminate problems, we use fewer pesticides and we conserve water and time. The key is to follow proper watering practices and to feed your lawn, trees and shrubs in a timely and responsible manner based on instructions provided by your lawn care professional (assuming they’ve provided you with that information). Another factor is renovating or re-furbishing your existing landscape through aeration and seeding or proper pruning of shrubs. These practices will thicken lawns, help to choke out weeds and crabgrass, and enable the grass to compete with drought-tolerant pests. If the lawn is able to stay thick and healthy, there will be fewer sparse areas, reducing the amount of spots for weeds and crabgrass to take over. Another factor for plants and grass is to properly utilize drought-tolerant plants or grass cultivars when water is not abundant or when full sun adds to the stress factor. Just the opposite applies if water is too abundant or if shade inhibits growth or causes fungus or disease problems. These are just some of the factors associated with environmental concerns and our external effect on our landscape. Once again, consult Lawn Connection or your lawn and tree and shrub professional for recommendations or diagnosis if you want to head off the problems before they become costly and irreversible.